An excellent den frame that can be used with lots of den making materials. 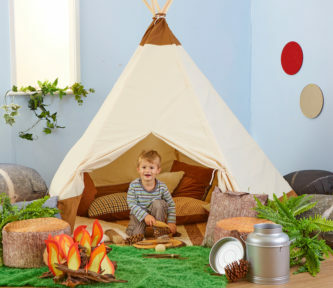 Children can use their creativity and imagination to design their den. Use with blackout material for a dark den, different materials for a magical cave or a made-to-measure den covers. We have a huge range of den making materials for children to design their own spaces with, including pegs, fabric and sensory den resources. My niece and granddaughter have had a fabulous time putting this together by themselves - really easy to read instructions. The children I will care for in the future will have an amazing time with this. The bag it comes in is brilliant it makes it's storage and transport easy.